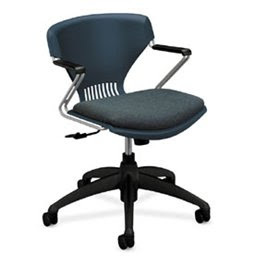 This is G34 Task Chair from the Collection: Olson Seating- G20 & G30. This versitile line can be used in a variety of environments- classrooms, labs, cafeterias and more- for a coordinated look throughout your school. The HON Company is a leader in the design and manufacturing of office furniture including chairs, files, panel systems, tables and desks. Headquartered in Muscatine, Iowa, The HON Company has numerous manufacturing facilities strategically located throughout the United States, and offers its products through a nationwide network of dealers and retailers. The HON Company is always looking for passionate, intelligent self-motivators who welcome new challenges in their careers—people who are creative, flexible, collaborative and customer-focused. More than just a company motto or slogan, their philosophy serves as a checklist for every desk, cubicle, table, filing cabinet and chair they design and manufacture—to make sure that their full line of smartly-designed furniture is durable, flexible and comfortable for every customer. The landscape of today’s office and classroom continues to change with new technologies. That’s why they’ve created office furniture, teacher stations and student desks that anticipate and adapt to the next waves of high-tech products like the iPhone.